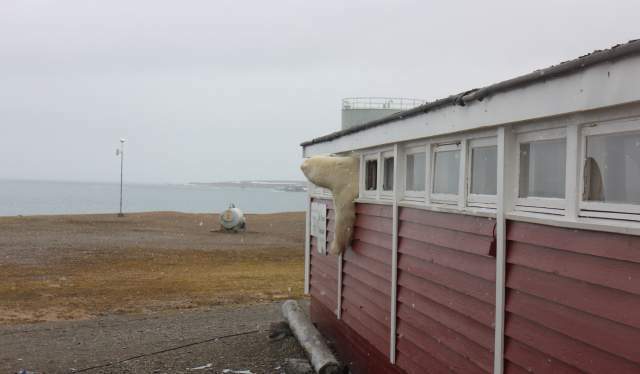 On Sunday night, a polar bear broke into the dry food depot at the Svalbard hotel Isfjord Radio. After hours of chocolate munching, the felon escaped through a narrow window. 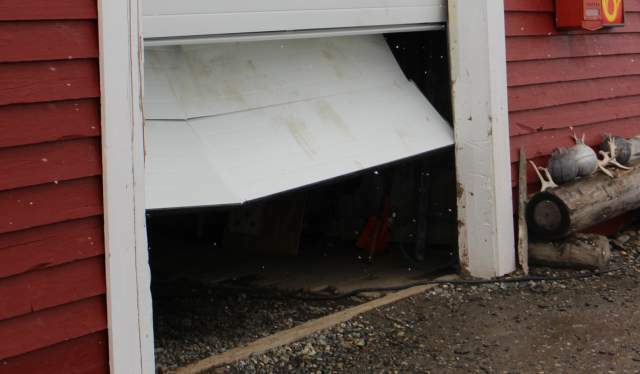 A broken garage door. 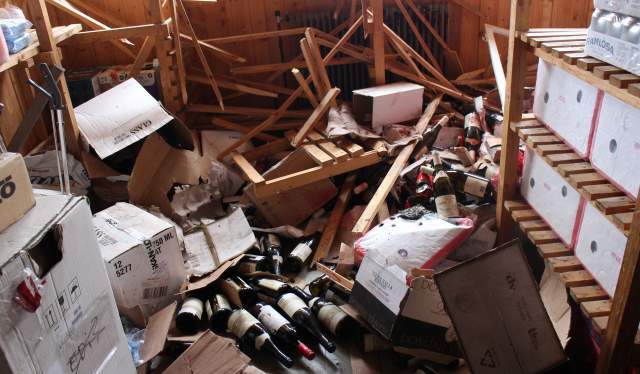 Wine bootles, shelves and windows shattered across the floor, along with blood and feces. A ferocious attack on the chocolate provisions. It may sound like a teen house party gone wrong, but at the Isfjord Radio Hotel outside Longyearbyen on Svalbard, a different kind of party animal unleashed its forces as Saturday night turned into Sunday morning: A polar bear failed to resist the temptation of the hotel’s dry food storage room. Renate Pedersen is the general manager at the tourism company Basecamp Explorer Spitsbergen, which operates the Svalbard hotel. She describes the event in a fairly undramatic way. “Our stationmaster Malin Stark went for her routine morning walk to the station, and she was primarily annoyed when she noticed that our new gate had been broken into. But when she saw displaced bags of food waste and heard distinctive sounds from the garage, the found the shortest way back to the main house”, Pedersen says to Visit Norway. Even though the polar bear easily made its way into Isfjord Radio’s storage room, getting back into the cold, free nature proved to be a more difficult task. “Our employees are prepared for situations like these and are skilled shooters, but they needed help to get the bear out – or, at worst, sedate it. The door opens inwards, and it closed after the bear entered”, says Pedersen. Several of the depot’s windows were broken, and after two and half hours, the huge bear literally made a narrow escape through one of them – probably motivated by the sound of the Governor’s helicopter, which arrived on site soon after being notified. However, it returned later on Sunday – this time without breaking into the storage house, but rather to have a nap in a safe distance to the hotel. When it once again started showing interest in the depot, guards used flare guns to scare it off. Isfjord Radio is located 90 kilometers outside of Spitsbergen’s administrative centre Longyearbyen, without road access, and thus secluded from the archipelago’s urban settlements. The former radio station from 1933 has been transformed into an Arctic adventure hotel, with the wild and beautiful nature as one of the main draws. Sporadic visits from the majestic bear comes with the territory, so to speak. 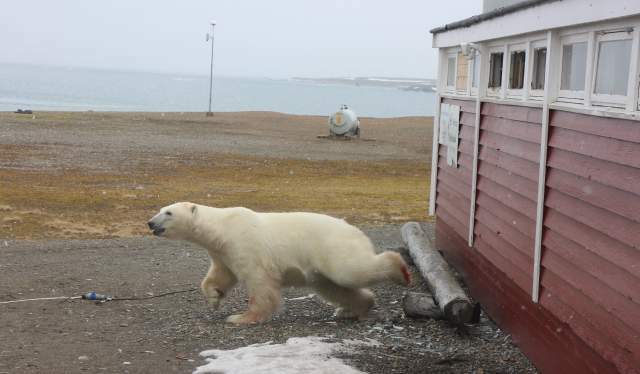 “Visits from polar bears are regular, not least in the summer. They come down along the west coast and pass Isfjord Radio. Last year we had seven bears here at once – two females with two cubs each, and a male”, Renate Pedersen says to Visit Norway. She describes the polar bear as a burglar by nature. The bear’s hunger for chocolate comes as no surprise to the general manager. “It may seem weird that the bear went straight for the chocolate, but we’ve seen this after other bear break-ins as well. Often, boxes containing chocolate spread will be licked clean”, Pedersen laughingly says. Isfjord Radio is working to prevent this from happening again. As opposed to what some outsiders seem to believe, polar bears do not roam the streets of Svalbard freely. However, the world’s largest predatory land mammal is definitely one of the Arctic archipelago’s most prominent and iconic residents. And the chance of running into one of approximately 3000 polar bears is always present on Svalbard. That’s why everybody roaming outside the settlements is required to carry effects used to scare off curious bears, such as flare guns and flare pens – as well as a rifle and the skills to use it if called for. Having a guide or a local by your side is strongly recommended. Still, having a bear come as close as the one ravaging the food storage at Isfjord Radio is rare. “Polar bears are known to have an affinity for food and the smell of it, but it’s not common for them to enter cabins or buildings where people are nearby”, the Governor’s inspector Vidar Arnesen says to NRK. His colleague, communications advisor Terje Carlsen at the Svalbard Governor’s Office, argues that humans should be aware of who’s the boss on the northern islands. 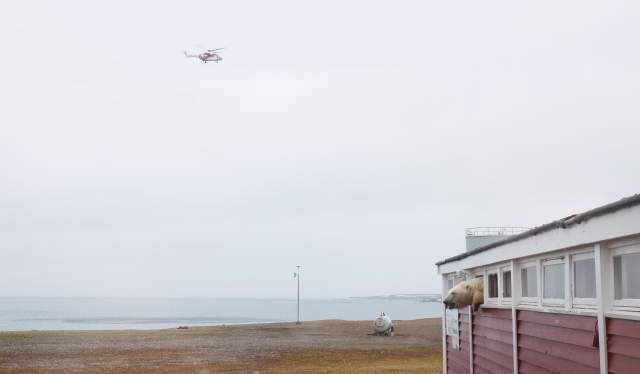 “This is the home of the polar bear, and it does happen that they get close to cabins and houses. But from another point of view, I’d say we humans are the ones getting close to the polar bear”, he says to NRK. The Svalbard Global Seed Vault celebrates its 10th anniversary this week. The tourism manager at Visit Svalbard marvels at how the the strictly inaccessible depot – and its mythology – has become the island groups biggest hit.